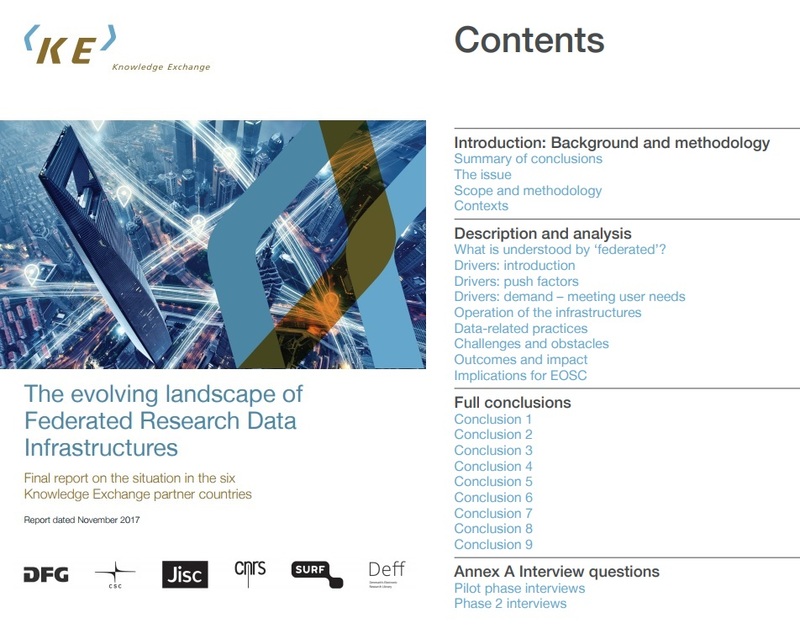 This report, commissioned from Knowledge Exchange (KE), is an overview and synthesis of the evolving landscape of Federated Research Data Infrastructures (FRDIs) in the six KE partner countries: Denmark, Finland, France, Germany, the Netherlands and the United Kingdom. The fieldwork and study underlying the report were undertaken by InformAll CIC during the first half of 2017, on the basis of interviews with experts from a range of organisations that run federated infrastructures in the respective countries. Federated Research Data Infrastructures (FRDI) is an infrastructure where a range of distributed services – focused on the actual demands of research – are coordinated by an overarching level, with the aim of providing a potentially seamless access to research data and tools. Federal approach offers researchers easy points of entry into complex, constantly-shifting infrastructure ecosystems. The best-known initiatives in the planning of Federated Research Data Infrastructures (FRDI) the European Open Science Cloud (EOSC). FRDIs can apply to all research disciplines, including physical sciences, life/health sciences, environmental sciences and humanities; they may also be multidisciplinary. Disciplines carry their individual characteristics, e.g. sensitivity and confidentiality of research data, which have a considerable impact on the nature of the federation. Some FRDIs recognise importance of a holistic approach to their service offer, articulated around the entire research data life cycle. Other factors that FRDIs address include AAI (authentication, authorisation, identification), with the legal issues that this raises; usability/interoperability; data standards; security; ethical and legal issues, particularly where sensitive data is involved; sharing and linking; and openness. Which are the main drivers for federating RD infrastructures and services ? What are the consequences for research and researchers? please take a loot at a brief overview (by Dr Matthias Katerbow and Dr Stefan Winkler-Nees, - both from Deutsche Forschungsgemeinschaft, DFG/ German Research Foundation) of the report's contents published on ZBW Mediatalk.